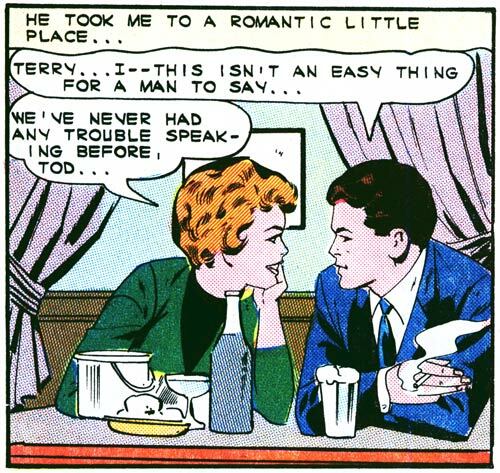 Art by the Vince Colletta Studio from “Symphony of Love” in FIRST KISS #39, 1964. This isn’t an easy thing for a man to say…well, at least not dressed this way. But, if you give me a minute, I’ll slip into a tight dress, a pushup bra and some pumps. Then I’ll tell you everything. They say couples choose each other because the other person looks like them. Certainly is true in this panel – other than hair color but she’s originally brown haired. Dave, I suspect that the resemblance between these two characters is because the same artists drew them. Still, point taken. People often do pre-select based on characteristics that make them feel comfortable.